200 more of the easiest recipes in the world -- each with less than 6 ingredients, a few steps, and most just 1 hour from prep to table -- are lavishly illustrated with 1,000 mouthwatering photographs making mealtime, snack time or any time quick, tasty, and simple! What's for dinner? 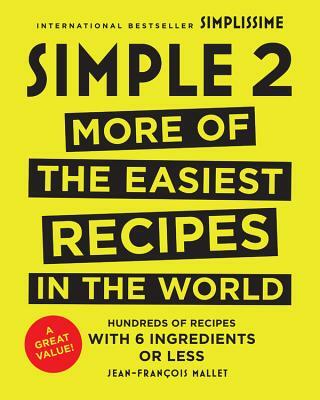 Simple 2--which Epicurious calls an "ultra-paired down, visually-instructive cookbook"--has the answer. With its clean design, large type, straightforward photos, and handy icons, you can have a delicious meal on the table in minutes. Through combinations of basic flavors and fresh ingredients, chef, food photographer, and cookbook author Jean-François Mallet helps anyone, the novice and gourmand alike, prepare tasty time-saving meals. His "at-a-glance" approach will change your view of cooking. In a few short steps, you'll find yourself able to make dishes as varied as Easy Cassoulet, Chinese Pork Ribs, and Glazed Lemon Pound Cake. There's a recipe for every occasion and season, whether it's a quick appetizer, hearty soup, cheesy pizza, or rich dessert. Want something a little different? Mallet's training as a French chef is evident in his more unusual recipes, such as Grand Cheese Soufflé and Squid Ink Paella.